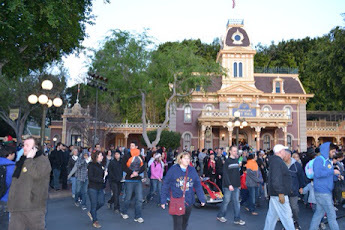 Disney News and Interviews From The Mouse Castle: One More Disney Day: We're Here, Now What? Props to Disneyland for getting the crowds in quickly. I got through the main gate about 6:20. By 6:25, I witnessed a marriage proposal in front of the floral Mickey. She said yes. The crowd went wild. I quickly found some friends as weird as me who are committed to the next 24 hours. All we have to do is decide what we want to do next. First, the locker line. Then the coffee line. Then we stood around and told dirty jokes. We know how to rock Disneyland. OK, I guess we can get FastPasses to Star Tours.